I am currently sitting at the bank waiting to sign some paperwork. So, why not update my blog while I wait for someone that is running almost an hour behind our appointment. 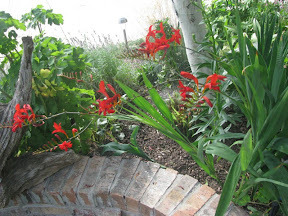 Rob Proctor who provides the gardening know-how for 9News viewers here in Denver recently had commentary about garden work. He specifically was speaking in regard to it bring late summer and being able to sit back and relax. He continued to say there is not much to do in the garden right now. So he is just sitting around watching. Fine for him. I have found I do not learn much from him. I am more energized than ever in my garden this season. I spend at least three to four nights a week working. Last night I added some more fine line buckthorns to the perennial bed to create more of a background screen for my patio. The new ones are not near as lush and full as my original. The one in the middle. 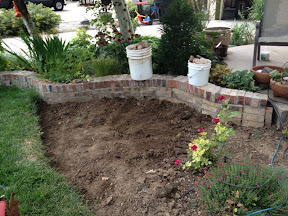 But they will fill in once I get them established and start fertilizing them. 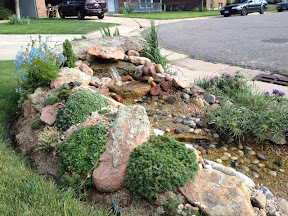 I cleaned out the pond filters, fiddled with some irrigation, and did some weeding. More work later today. 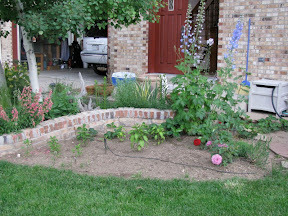 As this property and my gardens evolve and grow in the front yard I found that I needed a place to sit and enjoy them. I space that was calming but functional. All of my areas have been created in the existing beds. So I have been fortunate, creative, and practical in my design. So far. I built the brick wall the first summer we moved here using left over brick from the building of the house - that happened in the 1980's. Over the years the small space has been used a a vegetable garden. It just isn't quite big a big enough space to be utilized in such a manner. I decided a couple of years ago one of these summers I was going to turn this into a patio and sitting area. This was the year. We had about 100 leftover pavers from a project at work. Most were of a consistent size, but there was quite a hodge-podge of others. My boss said he was just going to trash them. And I instantly said, I will take them. I knew what I was going to do. 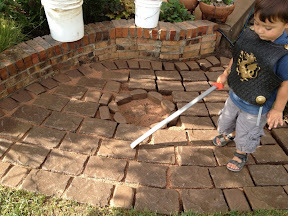 I began prep,work as the area was not level. I graded it down towards the grass on purpose for drainage. Well, it is was shear misery. The area hadnt been tilled or turned in over a year and turned into sort of a slight trash area. So I struggled with the grading. Eventually I though I got it close... Close enough. I have had it, I am done. Not quite perfect but I couldn't take the grading and moving soil anymore and I was anxious to have it complete. I spread my sand. Made a trip to home depot for more. 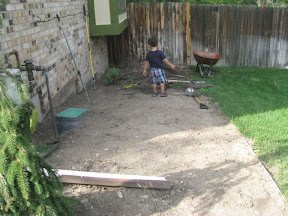 I had all of the boys at home help me move the stones to my work area and hand them to me as I worked. Jacob helped keep Nathan entertained while I worked. Some of the last stones ended up in odd placement, but I was running low with little choices. DONE!! I started spreading my sand between my stones and running a broom over it and rinsing it with water for settling. DAMN!! Back to home depot. Need more sand. Filling in with sand. With a little help. Aaaaahhhhh, FINISHED!!! Rinsed and settling. It is still settling so I will have to purchase some more sand in a month or so to finish it off. Now the hunt is on for the perfect outdoor bistro table and two chairs. Then I shall blog from my new spot. Notice the shape? I purposely left a hole in the center as the iris and pupil of my eye. Complete with an irrigation mist emitter. I noticed before I started the project it was shaped like an eye. So, the eye of my garden. In my mind's eye. I will add plants with lots of color. Some of the tallest trees in the world live in the pacific northwest and northern California. The giant sequoias. Have you ever seen anyone prune these or remove one? If you have you should look it up on YouTube. Truly spectacular. In Denver our tallest tree probably reaches a height of 100 feet. Those are still a challenge to prune. Our bucket truck can reach a height of about 60 feet. That means they have to climb out of the bucket and climb the rest of the way to complete the pruning. With newer construction, especially in areas where a lot of scrape-offs are completed the yards are much smaller and cannot accommodate trees of this size. 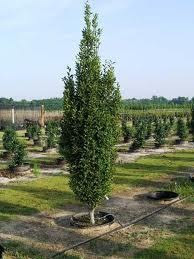 So many of the newer variety of trees available, being grown and sold are not near this size. And there are many new more upright and columnar varieties. Crimson spire oak. This is the fall color. 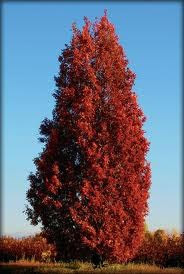 Crimson sentry maple. This one stays purple tinted all season. These trees also require much less pruning over the life of the tree than the larger trees. 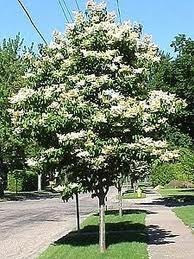 They do not provide the broad, expansive shade that the larger typical shade trees do. But they will provide shade and are great for screening. And some of the most fabulous residential and/or urban trees are not near these sizes. And still, we find ourselves trying to return to the old favorites. The ones that provide us such great shade and such wonderful branch architecture. Mother nature is the original architect. These large trees are important backdrops and canopy platings for a property. These will help in creating the understory and determine what types of plants can be planted underneath. Two years ago I had our crew plant a Japanese tree lilac in our front yard. It is doing very well. 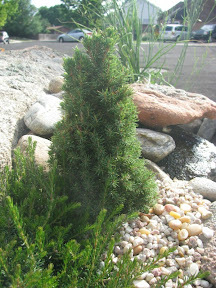 Last spring I order what I commonly call "miniature trees". Not all of them are actually trees. 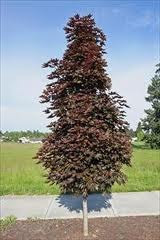 Many of them are just very dwarf varieties of shrubs and small conifers or evergreens. This spring I had the fortune of finding a small garden center attached to an Ace Hardware-aptly termed the Big Tool box-that carries a decent variety of these miniature trees. They have the best selection in the spring. I have since become obsessed and borderline compulsive with these little minis. 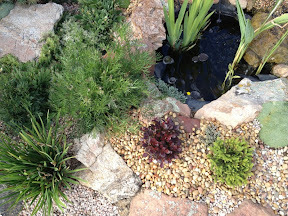 They have just added such sustained texture, color, and variety to the rock gardens. 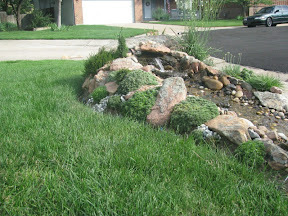 I have them both in the scree rock garden and in the waterfall rock garden. Some perform better than others. Some really need to be in part sun to part shade. I just don't have any shade in the waterfall rock garden. I am starting to get some in the scree bed. 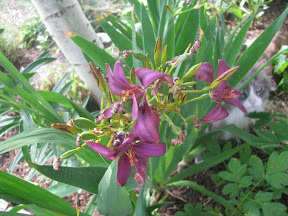 I have to be careful of the varieties I select to plant because of the exposure. We sit a mile above sea level and the sunlight is extremely intense. With the temperatures we have seen this season the scorch and burning on plants big and small is much increased. I have started giving everybody a brief mist with the sprinklers each evening. Spit on Denver water and their restrictions. I have an investment to protect. Another point of concern is our drying winter winds. I bought chicken wire, a tight weave weed barrier, and some loose weave burlap cloth. I built tepee cages and cover my little ones to help insulate them from the fluctuating temperatures and the drying winds. We at times can reach mid to upper 60's in the winter and then just plunge to freezing depths in just a day. In December and January we receive our wonderful (not) chinook winds. Winds can be so destructively drying. I also water everybody every three weeks over the winter. 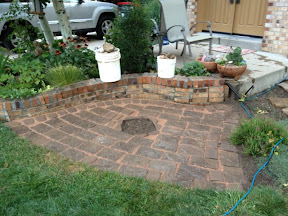 I even cover the waterfall and rock garden around it with burlap. This helps protect those plants and keep leaves and trash over of my water feature. Less spring cleanup. Neighbor's ask some questions, but it is like opening up Christmas come April. These minis are so easy and versatile to use in any area of a garden. 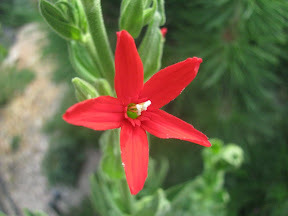 They are commonly used in fairy gardens, container gardens, backyard railroads, and as accents to perennial gardens. They come in so many varieties, colors, shapes, and growth rates-there is one for every taste and design. I don't have any in the perennial garden-yet. Wry one sold plant these little beauties. They will keep our garden looking fresh and interesting. Some practice is needed with them as to placement. I have lost a few. But never give up. 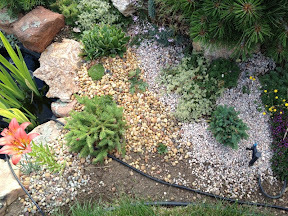 Upper left of the waterfall cap rock is a Jean's Dilly Alberta spruce. 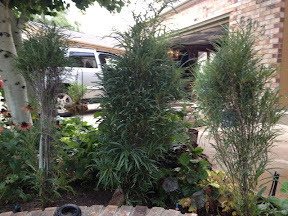 Lower left is a Pusch Norway spruce. Ordered from Two Green Thumbs. To the right is a hedgehog spruce. He has suffered some minor scorch. Oohing I can't reverse at this point, but I am thinking he isn't receiving quite enough water. 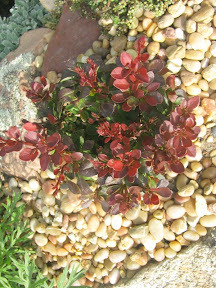 Left is a dwarf red variety of barberry. Just to the right is a dwarf variety of spruce. He absolutely scorched to have death. I could probably save him, but his structure and integrity as a specimen have been compromised. This photo is shorty after planting. Almost directly in the center of this photo is a dwarf cypress. It has more of a yellow-green foliage. So far not much luck with these guys. I am not giving up. I shall try another. Just behind him hidden under the skirt of the dwarf pine is another cypress. It is more of a green and a globe growth pattern. This one is doing very well. 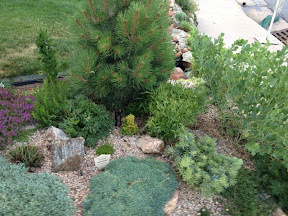 I have also added some juniper varieties and some mugo pine varieties but I do not have any updated photos of these yet. I will do so soon. Over time I will snip back their tips to keep them dwarf and eventually do some root pruning to keep them compact and dwarf. Until then, find somewhere to purchase some of these to fit your garden taste. You won't be disappointed. My mother has pictures of me as a young child tending to the houseplants and watering some garden plants. But I wasn't always a garden nerd. Somewhere between those small years and my young adult years I was caught up in other things. Eventually I found my path again. I work for a small tree care company in Denver. I graduated from Colorado State University and have held various positions over years in a variety of capacities. At American Arbor Care I am currently an arborist in client sales. I really hate calling it sales. Because I do so much more than just sales. And it isn't just about pruning. I work with clients on all types of projects and give them as much information and knowledge as I can. If I don't know the answer I find it. I try very hard, but sometimes I get it wrong. We are a for profit company and so we do have a bottom line to consider and employees that need hours. However, we ultimately strive for what is fair and honest, doing right by the owner and the tree. When people hire us and they receive me as an arborist it is more than just my job. I have truly found a job that I enjoy going to every day. And I have had to do some pretty crappy jobs. From loading up a bag of lion manure that spilled on me, to dragging thousands of feet of hose a day, to very physical labor with some pretty damn horrible people. So glad those jobs are past me, and thankful because they made me the arborist I am today. All those roads have led here so far. And to those that didn't appreciate me for what I could do and saw me as a woman, well sticking my nose up at you and then some! Trees provide us with so much more than just oxygen. They enhance our lives in all facets, on all levels. So I encourage everyone to find a local arborist that they can form a long standing and trusting relationship with to help them protect their investment. Trees should be looked at as an investment. Oh, and make sure they are ISA certified, licensed, and insured. Trees come in all different shapes and sizes with various degrees of challenges and care. The most important thing to remember is RIGHT PLANT, RIGHT PLACE. I cannot express this enough. I have saved a few trees from the chainsaw. And I received a fabulous call from a client last week. She called earlier this spring about her native plums getting a disease called plum pockets. I told her I could fix them. The company she hired last year failed miserably. Obviously didn't know their products. I told her trust me, I will get it right. This lady did not have the easiest heart to melt. I had drool charm all over her. These applications are tricky because of the timing and the requirement of multiple applications. Well, she called me last week and told me it worked and I would be receiving some jam later this summer. They are almost ready to harvest. I have to say my heart swelled and I melted her and gained a wonderful new client. I shared the news with the applicator this morning. I will share jam with him. I just love gardening and trees. My office manager I think, thinks me a little crazy. I am such a sucker for a fabulous specimen of any kind. I recently discovered on of our clients has two hazelnut trees on her property. Hazelnut trees in Denver???? How 'bout that! And Colorado just recently lost its state champion cottonwood tree. 150 year old tree, likely died because it didn't receive enough water. Made me shed a tear. A couple of weeks ago I noticed these new critters on my pasque flowers. I didn't think much of them at the time. Thought they were kind of pretty in a bug way. 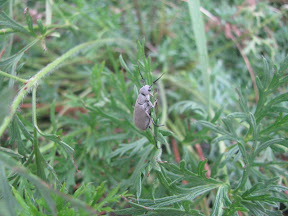 Not lady bird beetle pretty, but unique and so grey pretty. I had never had them before. 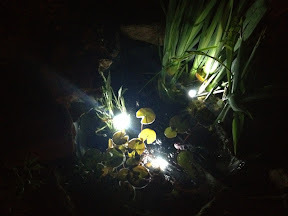 Tonight I was out adding some water to the pond and the bog garden pot, and feeding the new goldfish when I discovered dozens of them. Only on the pasque flowers. I mean dozens. I took several photos with my iPhone, but reached for my camera to take some macros. The pictures on my iPhone show their numbers but not their details. I have five pasque flowers in the rock garden. Two of them are the same color, the others are other newer variations. I emailed photos to my office manager, Lita, from work. I deal with insects every day, but most often it is with trees, shrubs, and grass. I have never had an insect or pest issue on my garden beyond spraying with water. 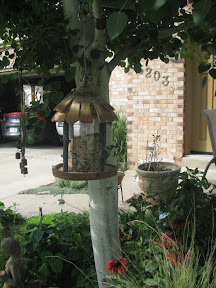 I do a soil drench on the aspen trees for aphids each year because their honeydew drips all over the shade garden and our front porch. Sometimes when I have a slug problem I spread some organic bait. I am not really an organic gardener. I use pesticides at work all the time. I would rather spray it and take care of it and use cultural practices to treat. At home there just hasn't been a large need. I texted Lita because although she is not an entomologist by trade she is a huge insect connoisseur. So between the two of us we figured it out. 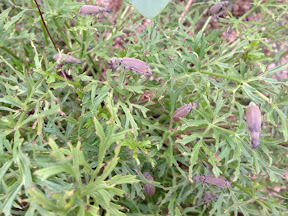 They are Ashgrey blister bugs. 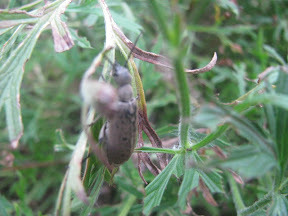 They have an interesting life cycle that revolves around grasshoppers. 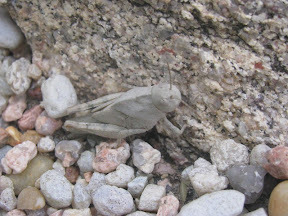 Last year we some issues with grasshoppers and I just let them be. It was not a threshold that required spraying. Now that I think back that may have been a mistake. These critters are actually feeding on the anemone. So I will bring home some carbaryl and spray them. Can't have this going on in my garden. This little guy was found on the backside crest of the waterfall. 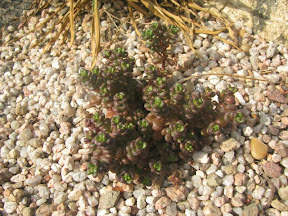 See how he blends into the pea gravel and small cobble ground cover? I have never seen this color or species in my garden or one this color period. He is rather grey and opaque. He is short-bodied and round. I only discovered one of them, so for now he can stay.